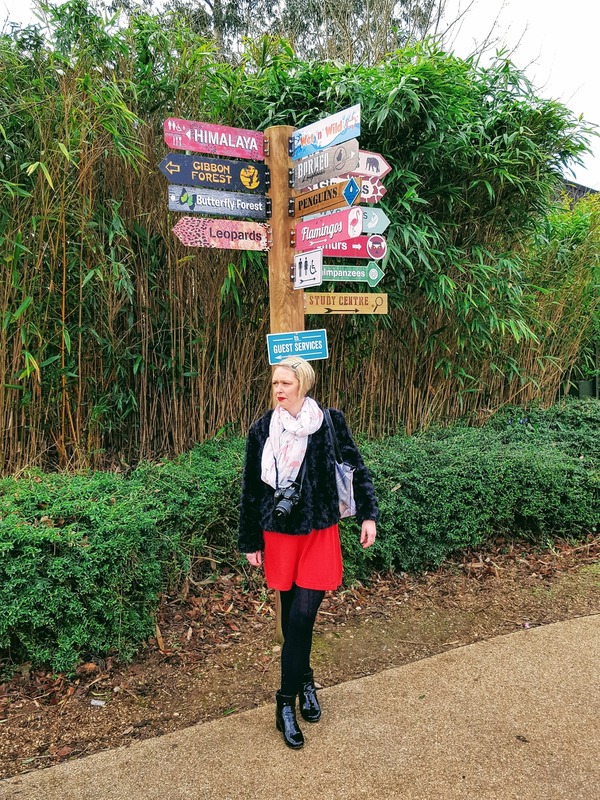 What I Wore To The Zoo.Happy Monday Friends.Over the half-term school holidays, we went to visit Twycross Zoo in Atherstone. We love to visit the zoo and Twycross Zoo is one we had never visited before. I was so excited to see what animals would be there. I even wore my flamingo scarf as I love seeing the flamingos. We could not have asked for better weather really for the time of year. The weather was almost perfect. It was really cold but the main thing was, it was dry and the sun was shining brightly. All wrapped up but I forgot my gloves. Typical, I always forget something. I forgot something else too. Oh, that is it, my hat!! 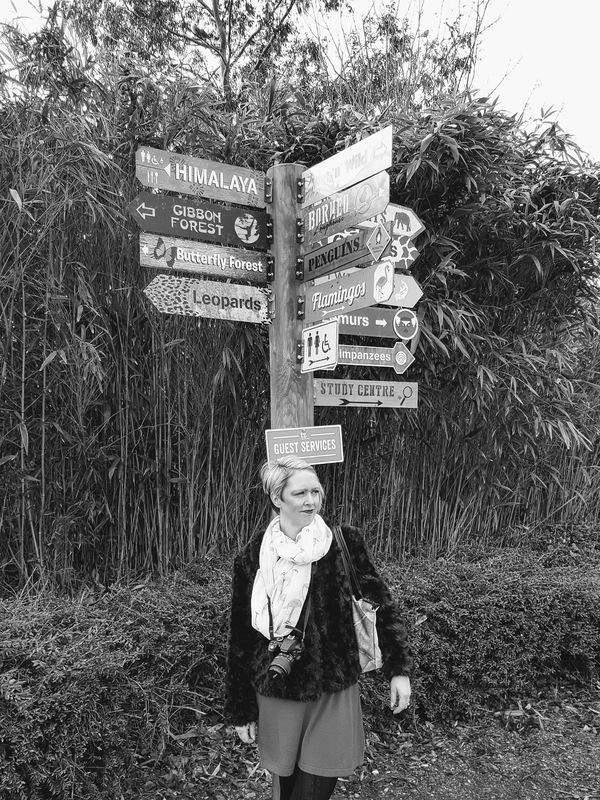 Which way to go first? Off we went to the Butterfly Forest. It was red hot in here and we all warmed up nicely for a while. I love to see the butterflies. It is not often you can capture a picture on your phone when you are out at the park because as soon as you see one, it flies away before you get chance but I manage to get a few good photos in here. I did get my big camera out but it got so steamed up with the heat, I could not see through it to get any photos. Aww, the Meerkats are so sweet! Look at the little one keeping a lookout. Adorable. The Penguins were at the top of my list to go and visit, love seeing the penguins. The penguins at Twycross Zoo are adorable! Looks like they are enjoying chilling. How big is this bird!? Having fun with my not so little, mini-me! Quick looks around to see if we are safe! 😉 Yep! Mollie on my bag, how sweet!? We had a great day out but I never got to see the flamingos this time. It was so cold and the water they where they usually are was all iced over and they were all huddled together in the back of the park where we could not see them. No worries, I will hope to see them next time. Do you like to visit the zoo? Have you been to one lately? 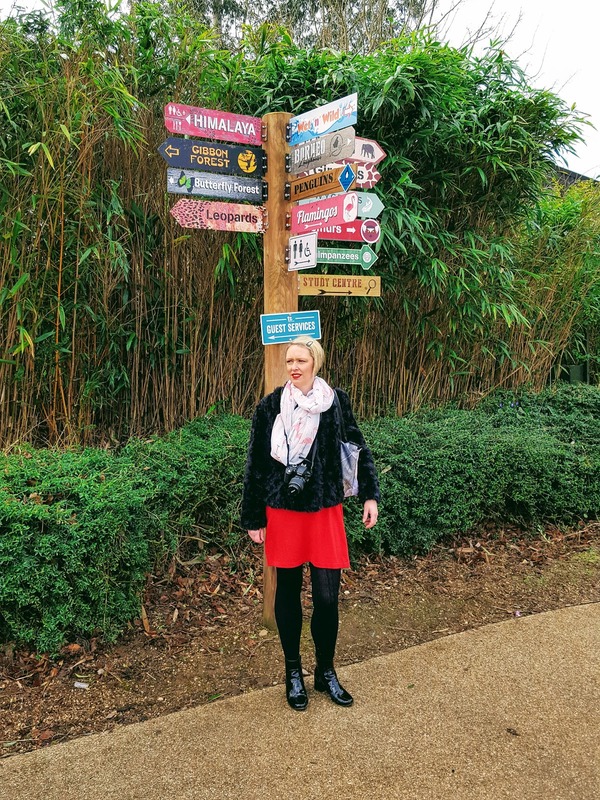 What I Wore To The Zoo: OOTD. Linking up at these fabulous parties: Where I Party. What a fun day out!! I haven't been to a zoo in ages. Looks like you had a fantastic day out! You can never dress too warm for the zoo since so much of it is outside!! 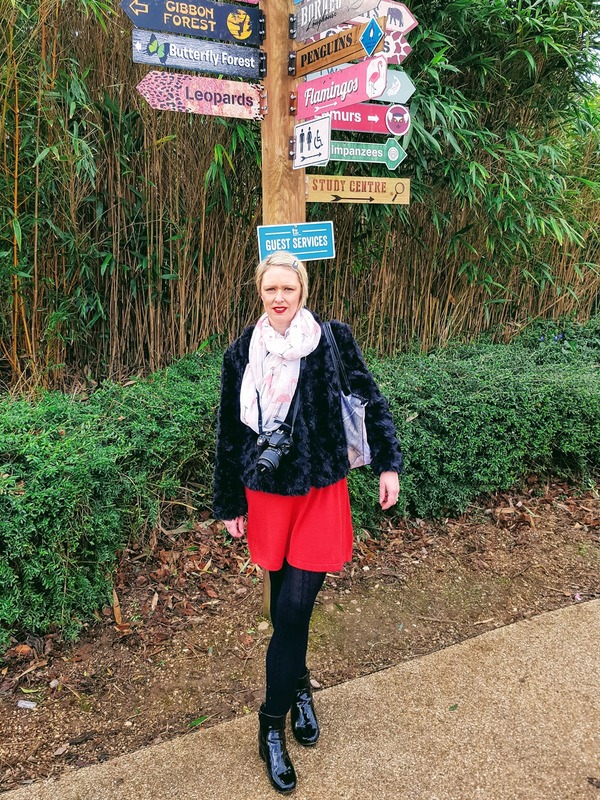 Being warm at a zoo is definitely the only way forward especially with the weather we've been having lately so the coat looks so lovely and snuggly for it plus very stylish too. What a fun day out and I love the outfit you wore! The red pop of colour is just the thing to brighten grey, dreary days! We love to visit the zoo, but it's a bit chilly out there at the moment for me! You look fab! Looks like u had such a lovely day out. We love visiting the zoo I love your photos especially if the penguines. Btw your not alone I always forget my gloves. The butterfly forest sounds beautiful and it's great that the red hot temperature kept you nice and warm. You look so glamorous! I love the fur coat and red dress! I love going to the zoo ! I love love the location of all of your photos, always. And I also love you in red. Such a cute layered Winter look. Keeping warm and stylish, Claire. I love your hair! You look so fabulous and perfect style for a visit to the zoo! Cute flamingo scarf Claire! Perfect to keep nice and toasty on a cold day. Sorry you weren't able to see any flamingos but you got to see some awesome meerkats! 😀 We have been to the zoo though not as of late. Hopefully as the weather warms we can plan a little trip over there. I hope your week went well. I can't believe it's Friday but yay to that! Lovely jacket. You look nice and warm. Fabulous faux fur jacket! It looks great with the red skirt. Thanks for linking up! Loved these fun photos! Your layered look is quite stylish for a day at the zoo. :) I really like your hair pulled back like this. I may just have to copy you for a style change. Thanks for linking up, Claire!